The Koran permits men to enjoy earthly pleasures in that they foreshadow those to come in paradise. Like the Greek Elysian Fields, the Muslim paradise is filled with the sweetest perfumes. The Koran even speaks of women, or houri, made of “the purest musk”. Arabia is the land of spice and perfume par excellence. Propertius, a Latin poet from the beginning of the 1st century AD, speaks of “Arabia of the thousand scents”. Their literature and poetry overflow with texts inspired by perfume and flowers. The poets Hafiz and Saadi sang of the rose whose scent is the most highly valued in the Arab world, along with musk. Rose water was used to perfume the rooms of the house or flavor certain dishes: loukoums, sweets and sorbets. The sides of drinking cups were impregnated with fragrant resins. Coffee was mixed with ambergris. The Muslim purification rites were very strict and accompanied each step of life. To purify themselves entirely, the men went regularly to the public baths. In their harems, the Muslim women spent a great deal of time enhancing their beauty. 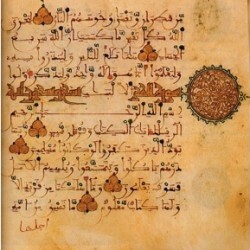 As early as the 8th century, Muslims began translating Hellenistic, Persian, Roman and Byzantine texts, all subject to Islam, and stored them in immense libraries. These translations lay at the origin of the medical, pharmaceutical and chemical sciences in Europe. Medieval alchemy owes its existence to al-kimîya, which holds an important place in the art of distillation. The Arabs did not invent the technique, but they did improve it and spread its use throughout Europe.